Segway-SE-3It’s a natural extension of Segway’s Patroller product line — an ideal match for missions that require a larger vehicle, which displays a more visible and obvious security presence (even in a parked position without a rider aboard), or that require a rider to frequently mount and dismount the vehicle during a patrol. The SE-3 boasts rugged Whelen® emergency lights, a headlight, brake light, siren and lockable storage, as well as a 4.3″ color display that is sunlight-readable, which provides the rider easy-to-understand operational data including speed, battery life and distance travelled. Contact us at 202-682-1980 or email info@capitalsegway.com to inquire about purchase or demo of the SE-3 today! 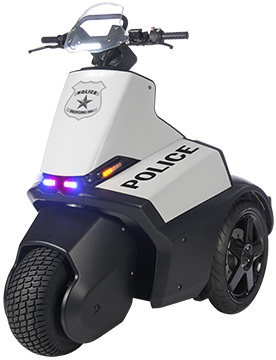 police-i2-patrollerThe Segway® Personal Transporter (PT) is an ideal policing and security partner. Raised an additional eight inches off the ground, it provides officers with superior sight lines for traffic management, crowd control, and community policing giving prominence when they need their presence felt. The Segway® PT is the ultimate icebreaker. Its presence facilitates conversation and encourages effective community policing. Officers are more approachable when they are on a Segway® PT than when they are sitting in a cruiser or riding on a bike. Plus, officers get all the attention of horseback patrols without any of the feeding, grooming or housekeeping. Got a lot of area to patrol and fewer officers for coverage? 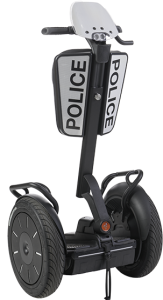 The Segway® PT can move an officer, smoothly and quietly, at 2-3 times walking speed. It can easily double the amount of area a walking officer can cover, and can transition immediately from walking speed (3 mph) to sprinting speed (12.5 mph) when an officer needs to get somewhere fast without causing alarm.